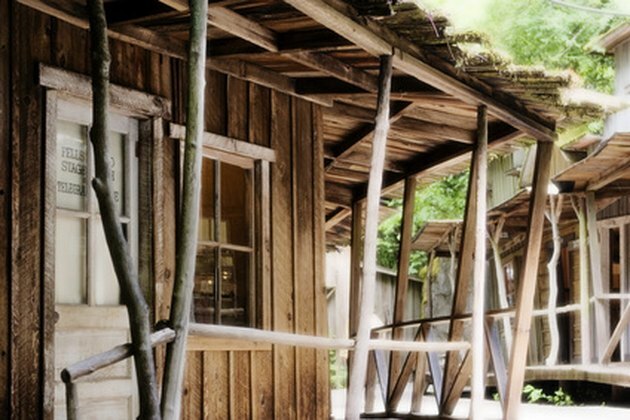 Whether you're designing sets for a play, a commercial development, or a children's playhouse, storefront buildings from the Old West can be a delightful design project. Research materials--in the form of photographs from the period--are in abundance in books at your local library and on websites such as LegendsofAmerica.com and AmericanWest.com. Proper research will provide you with many design ideas. Old West storefronts can provide a trip through time. Decide what kinds of stores you want in your reproduction of an Old West town. Imagine the town in your mind, then populate it with stores the residents might need. Most frontier communities had a saloon (or two), dry goods store, livery stable, blacksmith's shop, a sheriff's office and jail, a lawyer's office, bank and boarding house, possibly with a restaurant. Other typical stores and offices might include a stage or freight office (near a railroad), a barber shop and a mortuary. Pick a geographical style. Storefronts in the Southwest were usually one-story buildings with stucco and exposed rafter vigas--the ends of timber roof rafters that stick out the side of the building just below the roof line--with deep porches and small windows. Storefronts in the Plains were faced with wood siding, were often two stories and had traditional, four-pane sash windows and fancy entry doors. Those in Gold Rush towns were primitive versions of Plains stores--some were nothing more than large canvas tents. Porches and overhangs were common everywhere. Design to the appropriate scale. If your storefront collection is meant for children, make the buildings child-sized, with doors a little over 48 inches high. If your design will be used merely as a distant background in a stage production, use a smaller scale to fit more buildings into a "block." If you want full-sized buildings, remember that people in the Old West lived in smaller spaces than are common these days; an average dry goods store from the Plains was probably no more than 20 feet wide. Include all the "extras." Trim and accessories are what really complete the look of Old West storefronts. Elevated wood plank sidewalks are an important feature, as are horse hitching posts and rails. Signs should be large, colorful and hand-painted on wood in distinctive Victorian fonts such as Playbill. Focus on the windows. Because oil and kerosene lamps were the only form of artificial illumination, windows were key to letting in natural light. Keep the windows small, however--glass was a luxury item in this period. Mullioned sash windows with 9-inch glass "lights" were common in residential and commercial buildings, and large picture windows were rare. Select paint colors carefully for historical accuracy, as color choices were limited in the Old West. Builders could count on a good supply of white, black and red paint, and green was popular for trim. But other hues were scarce; gold-colored paint was used in a miserly fashion for only the finest decorative touches. Many commercial buildings were not painted at all and instead were allowed to simply "weather." Use wood siding for exteriors. Except in the Southwest, where stucco was the norm, wooden boards were the most common building material. Few Old West storefronts were faced with brick or limestone, except in the largest, most cosmopolitan locations. Banks in Old West towns sometimes were built from masonry for security and image concerns.